Posted by Eddie & filed under Military/Aircraft, Mountains & hills, Science, September 24 2009. Last Sunday I spent the day in the Cairngorms (again). I walked from Loch Morlich, past Rothiemurchus Lodge (where I spent a week on a school trip in 1983), and into the Lairig Ghru pass. From the Lairig Ghru I climbed up to Coire Ruadh to the east of Braeriach to look for wreckage from a RAF Bristol Blenheim bomber that crashed here in 1945. I saw a lot of this wreckage on a trip to Coire Ruadh in August (see my previous blog posting ‘Yet another soggy night in the Cairngorms and yet more aircraft wrecks‘), but the debris is so extensive that a second visit was required to find it all. You can see new photos from this second trip on my website here. The view from this location down to the southern parts of the Lairig Ghru pass, and towards the western slopes of Ben Macdui are absolutely stunning, it’s a truly remote and wild area with high summits and glaciated corries. I also walked to the eastern end of An Garbh Choire, which is perhaps the most dramatic example of a glaciated area in all of the Scottish Mountains. 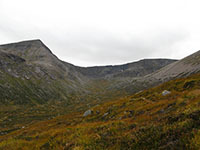 It’s an enormous corrie with smaller sub-corries scooping out cliffs from the Braeriach-Cairn Toul plateau. And there is a contemporary echo of those long-vanished glaciers. High up in one of these sub-corries, Garbh Choire Mòr, I saw two snowpatches, remnants of the snows of last winter. These snowpatches are called the ‘Sphinx’ and ‘Pinnacles’ snowpatches, after the rock climbs above them. The Sphinx snowpatch has not fully melted since 2006, and did not melt at all between the the years 1959 and 1996. This is the most persistent of the ‘perennial’ snowpatches in the Scottish mountains. You can see photos I took on the trip on my website here.